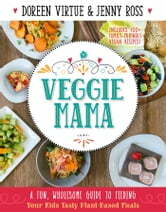 Veggie Mama is a manual for elevating your family’s diet to incorporate more whole, plant-based foods. The book features over 100 vegan recipes —including many raw options, using whole grains, legumes, nuts, seeds, fruits, and vegetables, along with superfoods —for growing kids of all ages. Veggie Mamas Doreen Virtue and Chef Jenny Ross discuss food allergies and present a program free of inflammatory agents that can that can create anxiety in sensitive kids, as well as worsen allergy symptoms. With menu-planning guides, brown-bag school lunches, and snack and dessert favorites, you’ll have everything you need to feed your entire family wholesome and delicious meals. Using these tasty, 100 percent plant-ingredient recipes —such as the Avocado Citrus Parfait, Pumpkin Seed Cheese Wraps, Veggi-wiches, and Nut Butter Bites —you will be pleasing your children’s palates and doing their bodies good . . . setting them up for a lifetime of wellness! Juicing: The Only Juicing for Health Guide You Will Ever Need:100 + Juicing and Smoothie Recipes for Weight Loss, Lower Blood Pressure, Reduce Acid Reflux For life!